(March 3, 2014)—With the opening night celebration of John Carpenter and his modern horror masterpiece THE FOG only a few weeks away now, the second annual CineMayhem Film Fest is pleased announce another special guest for this year’s fest, iconic genre actor Robert Rusler (A Nightmare on Elm Street 2: Freddy’s Revenge, Weird Science, Sometimes They Come Back) who will be in attendance for a memorable pre-screening Q&A before VAMP (1986) on Saturday, March 29th at Jumpcut Café (13203 Ventura Blvd.) in Studio City, CA. For the final night of CineMayhem, horror fans in attendance will be paying tribute to visionary storyteller, filmmaker and artist Clive Barker with a rare exhibition showcasing his “Moontribe” art series, a special viewing of HELLRAISER and more surprises to be revealed later this month. Before each classic screening, the 2014 CineMayhem Film Fest will be kicking things off with several selected short films including THE BODY by Paul Davis, FOUND by Rebekah McKendry, Patrick Rea’s THE HOURGLASS FIGURINE, MIRACLE ON METAL STREET by Carl Bachmann and THE SUMMONERS by Christian Ackerman. 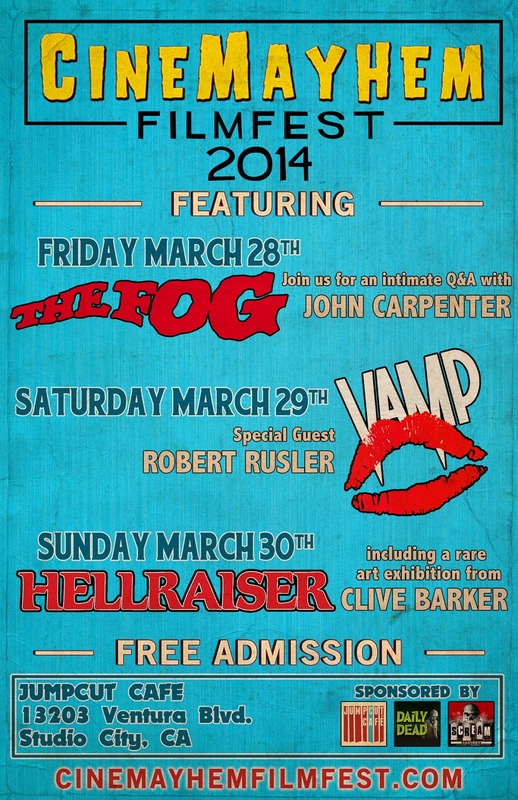 Each night there will be contests and giveaways, with Scream Factory bringing some fun surprises for our celebration of THE FOG on March 28th. Passes for the three day CineMayhem Film Fest 2014 will be available starting on Monday, March 10th via BrownPaperTickets.com- specific times will be announced via CineMayhem’s Twitter (twitter.com/CineMayhem) and Facebook page (www.facebook.com/CineMayhemFilmFest) throughout the course of the day. Due to this year’s intimate venue size, the free tickets for each night will undoubtedly go quickly so fans will want to be sure to check-in with CineMayhem on social media throughout the day on March 10th for pass availability for each night’s events. Created in 2013 by producer and horror journalist Heather Wixson, CineMayhem Film Fest celebrates the legacy of independent horror and the films that have- and continue to- change the landscape of genre cinema. For its second year, CineMayhem Film Fest is breaking tradition in order to create a truly unique experience for indie horror fans at its new location, Jumpcut Café by expanding its celebration of independent horror to three days, beginning on Friday, March 28th and running through Sunday, March 30th, but there will also be NO CHARGE for fans to attend any of the CineMayhem 2014 events.